There’s a reason we call this vacation rental a house and not a cottage. With three bedrooms and three full bathrooms, it’s our best option for families or couples who want the added luxury of a full-size home. Ohana House has an interesting history—it was built in 1942 using lumber from dismantled supply ships during the second world war. Since then, this Kauai vacation rental home has been fully renovated, but still retains its original materials. With its new, upscale furnishings, you would never imagine that our luxurious cottage rentals had such humble origins. 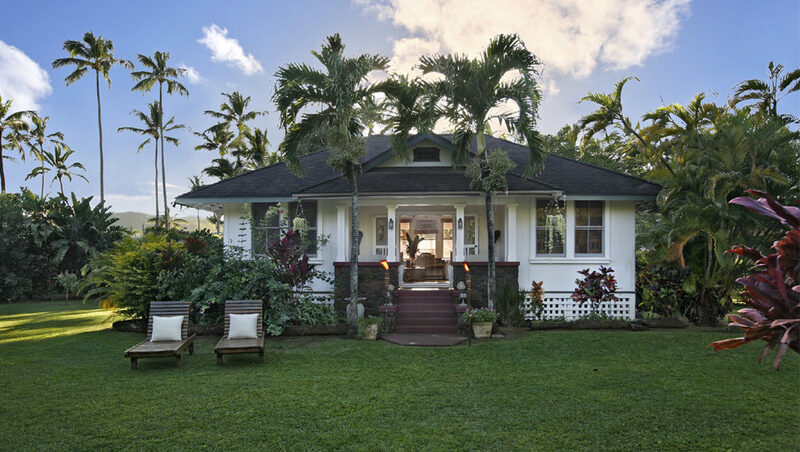 This rental home on the east side of Kauai boasts two bedrooms with queen-size beds, a third bedroom with two twin beds, a living room, and a kitchen. The kitchen comes fully equipped and features wood counter-tops, a dining table that seats eight, and a bar area that seats two. The rooms are decorated in a plush, contemporary style with tropical accents. Though the home receives good cross-breezes, each room has air conditioning and a ceiling fan. Just outside the front door, you’ll find a small porch with breathtaking views of the garden. The rate for Ohana House varies depending on the number of people in your party and the time of the year. The base rates are as follows, plus a tax of 14.962% and a cleaning fee of $250. 1-2 guests, $325, 3-4 guests, $350 to $375, 5-6 guests, $400 to $425. 1-2 guests, $450, 3-4 guests, $475 to $500, 5-6 guests, $525 to $550. 1-2 guests, $400, 3-4 guests, $425 to $450, 5-6 guests, $475 to $500. 1-2 guests, $350, 3-4 guests, $375 to $400, 5-6 guests, $425 to $450. Each reservation has access to the entire house exclusively. This luxurious and over-sized vacation rental is sure to book fast. Reserve your dates today! Our Vacation Rental is sure to spark fond memories of Hawaii.